Project: Adding a new backsplash. Why: A backsplash can act as a focal point in the kitchen, creating interest and balance between the other materials and elements. Details: The difficulty and expense of the project will depend on the complexity of the design. 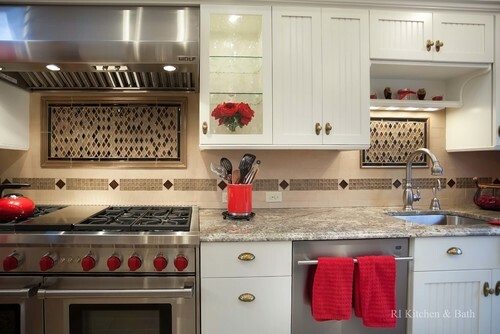 First you’ll want to decide what kind of backsplash you’d like to have. 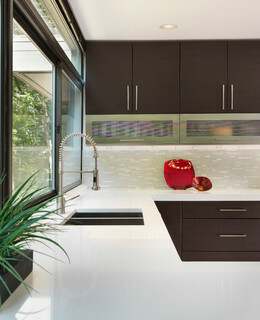 As mentioned, the options are endless, from smooth, backpainted glass to complex ceramic tile patterns and custom murals. Look at photos, research materials, meet with a designer and visit showrooms to decide what’s best for you. Measure, remeasure and remeasure, says designer Mariette Barsoum. This will help determine what size of tile or material will work best. Then think about how everything will fit together. This is where an experienced designer can come in handy. 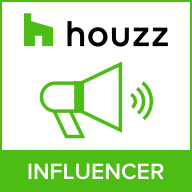 A designer will be able to quickly come up with ideas for how the tile layout will end and begin, how it will wrap around your cabinets or range hood, and so on. The type of countertop you have will be a very important determining factor. 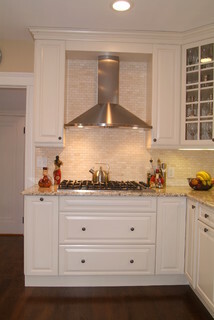 For example, a busy backsplash would clash with a busy granite countertop that has a lot of variation. Make sure to consider how the material will enhance the other elements in the room, and vice versa. You’ll then want to figure out how much tile or other material you’ll need. Barsoum says a good rule of thumb is to add 10 percent to the amount of square feet of space. 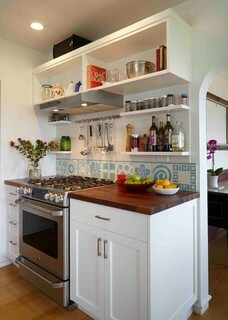 If you have 50 square feet for a backsplash, for example, order 55 square feet of tile. This will account for breakage and mistakes on the job. 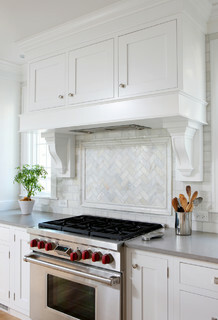 Cost: Because the options for materials are so vast, it’s difficult to give a ballpark estimate, but Barsoum says a typical backsplash including labor and materials should run around $1,500 on the low end and $6,000 and up on the high end. She says you can get 3-by-6 ceramic tile for $3 per square foot and 3-by-6 blue marble for $70 per square foot. In the example shown here, a kitchen backsplash Barsoum installed, she used marble that comes in 12-by-12 sheets at about $15 per square foot. Because there’s no pattern and the sheets are easy to work with, Barsoum says almost anyone can install these themselves. Who to hire: If you’re confident in tiling techniques — leveling a wall and adding grout — this could be a DIY project. But Barsoum says the more expensive the material, the more you should consider hiring a professional. For most jobs a tiler is your best bet. Best time to do this project: Either during a kitchen remodel or after. 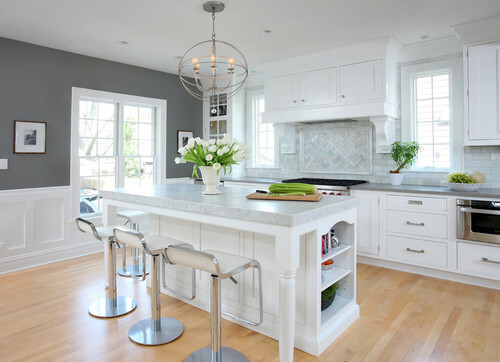 You don’t want to add a backsplash if you plan to remodel your kitchen anytime soon, because you’d have to replace the backsplash anyway once you start ripping out cabinets or adding countertops. How long it will take: Planning and getting the materials can take anywhere from a couple of days to several weeks. Again, it depends on the materials. 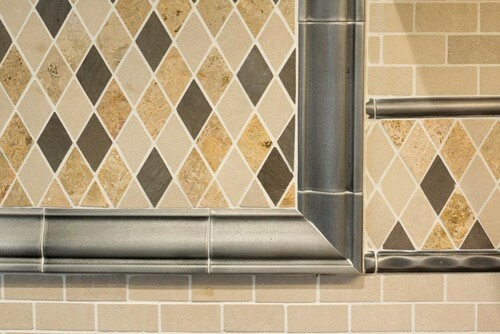 If your tile choice is in stock, you can have it in a matter of days. If you’re ordering handmade tiles, it can take six to eight weeks. Once the job begins, it typically takes two or three days for tile to set. The good thing is, you can still use your kitchen throughout the job.